When Gary and Patty Frame wanted to include their dog, Stella, in a celebration of their family business, they turned to The Dog Salon in Charlotte for a temporary tattoo. Lori Chatelain, a creative groomer, does the final trimming to Techno's new haircut at The Dog Salon in Charlotte, N.C.
Stella, a rescued Carolina dog who regularly greets customers at the couple's Baskets of Yarn shop in Charlotte, sported the design — the words "I" and "yarn" with a heart in the middle — on her back for an October business event. "Everyone loved it," says Gary Frame, who took Stella back for a green shamrock on her hip for St. Patrick's Day. "People are amazed — they do a double take." Pet tattoos — airbrushed designs most commonly created with a stencil and non-toxic dye especially made for animals — are a growing trend, according to the National Association of Professional Creative Groomers (NAPCG). The practice is an off-shoot of specialty or creative grooming, such as transforming a pet into a panda or other exotic creature, that emerged about three years ago, says the organization's president, Amy Brown. The national pets rights group PETA says dying a pet's fur can cause stress and lead to complications or allergic reactions that endanger the animal's life. They also say giving a pet a tattoo, which can feature a sports team logo, holiday-inspired design or tribal art, is insensitive to an animal's dignity. 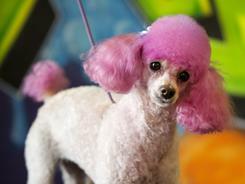 "Our dogs and cats love us regardless of how we look," says PETA spokeswoman Jane Dollinger. "We should extend the same kindness to them." Creative groomers — the NAPCG has offered certification for about a year — know that specific dyes safe for pets must be used. A dog's skin is more sensitive to chemicals than a human's, Brown says. 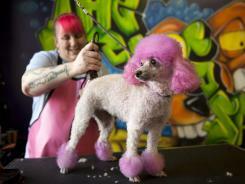 "As professional groomers, our responsibility is to encourage and promote a healthy skin and coat," she says. Heather Holland, owner of Lucky's Yellow Rubber Ducky Dog Wash in Shreveport, La., says the tattoos offer owners a fun and affordable way to celebrate their pets. "People love it — it's hilarious," says Holland, who recently dyed a Louisiana State University fan's golden retriever to look like a tiger. "It's a good form of expression. People can't wait for their friends and family to see it." A typical "tattoo" starts at $10 and can go as high as $20 or more depending on design intricacy and colors. The technique works best on animals with white or light-colored fur, and designs gradually wash out over time, Holland says. Techno shows off her new cut and color at The Dog Salon in Charlotte, N.C.
Tattoos are part of a growing pet grooming industry where a standard cut, wash and nail trim no longer will do. Groomers routinely offer teeth cleaning, mouthwash and spa treatments complete with blueberry facials and pedicures as services — part of an estimated $52.9 billion Americans will spend on their pets this year, according to the American Pet Products Association. Dog owners tend to be the biggest fans of airbrushed art for their pets, says Jessica Law of The Dog Salon in Charlotte. "A lot of people are really into the 'old school' tattoos like anchors or 'I love mom,' " says Law, whose shop specializes in all-over dye jobs, colored mohawks and other alternative grooming. Groomer Sheri Harvey of Sheri's Pampered Pets in Chester Township, N.J., says few owners take her up on the offer to put a star, flower, rainbow or other design on their pet. That's because many pet owners are unfamiliar with the practice and are fearful the dyes could injure their pets, Harvey says. "People don't know that much about it," says Harvey, who once put yellow roses on the hips of two Maltese dogs for their owner's birthday. "They are very skeptical about having it done to their animals." Law says she does hear the occasional criticism, but it's far outweighed by the reaction of owners and others who see a "tatted" pet at the park or out for a walk. "These animals get so much attention and love — they eat it up, from what I've seen," she says.